“Lamunan Oi! A Punk Daydream” is a scattershot documentary that delves into the Indonesian Punk Scene. The high octane Indonesian punk scene is also inspired by indigenous Dayak tattooing and spirituality, blended with their own form of liberty loving Islamic spirituality. It is a strange brew of possibilities, with the punks bejewelled with tattoos as a badge of honour, with dreams of equality. Unfortunately for the punks, Indonesia is in a twilight zone of post-autocratic autocracy, where tattoos are forcibly tabooed. Any talk of liberty and equality, in a post-autocratic autocracy, is also going to cause some problems. The dark days of the dictatorship are at an end, even though democracy is functioning in some kind of fashion, much of the old guard are entrenched and still in cahoots with Western corporate interests. Indonesia is land of contrast from unspoiled jungles, to the cesspits of rancid polluted rivers and shanty town slums brimming with diabolical poverty. Litter and rubbish is scattered everywhere. The shiny corporate hubs, in the flash city centres, have that sheen of Western dream of modernity, but these bright chrome beacons of Capital are surrounded by a mass of shacks, where the poverty stricken hordes try to eek a living. Indonesia is a vibrant but extremely unequal society. The power of the army is perhaps not what it was, but it is still an encompassing force to make sure that ‘order’ is maintained. In this morass, the fastest growing punk movement in the world walks, with their jeans, leathers, laced-up boots, tattoos and a whole myriad of wild hairstyles; they are also instantly ostracised from mainstream society (if such a thing actually exists). Their tattoos point them out for their outsider status. They are absurdly tabooed as criminals, but as they can’t get jobs, they live the street life, living off their wits and their own sense of ostracised community. Jimmy Hendrickx directs and edits with an unusual and uncooked approach. Jimmy Hendrickx dives in. There is no major introduction to the punks, The Dayaks or any historical context, just ready steady go! Kristian Van Der Heyden produces the documentary, as well as helping out as second unit director, and assistant editor. They both just leap and allow the alchemy to shine, a method I personally approve of. There is a sense of dislocation in this method, which reflects the strange life of the punks, their contrast with and inspiration to the Dayak and other tribal peoples, in what is left of the unspoiled parts of Indonesia. The Dayak live their life in the forest, surviving among the trees and rivers, inscribing their love of the earth with their ritual tattoos, symbolising their culture. The punks inspired by this symbolism create their own tattoo subculture, to give them a sense of belonging as they search for equality, where they sing about the earth, as well as longing for better days, where tattoos is not a big deal. The documentary begins in an abandoned film studio from the Suharto dictatorship. Discarded film reels and majestic trees intercut with a guttural punk rocker wailing away on the soundtrack. Laced up boots tap a rhythm on the dumped film reel cans. A tribesman wonders through the primal forest with his spear in hand, the idyll of the intact wilderness. A young boy paints himself with tribal dashes. The scene is intercut with three punks walking through a wooded land, with laced-up boots, Mohawks, jeans and a ukulele. A punk stares up at the trees, with nose piercings, Mohawk and with a skull tattoo on his neck. He is an imposing young man, but he leans his head forward on the tree, wearily. The shiny bright metropolis beams as ferocious guitar chords are strummed at speed, traffic jams, hordes of bikes, commuters going nowhere fast, modernity, trees hugging the lanes! Punks scream on the soundtrack. The city cuts to unfinished slabs of concrete and a streaming piles of trash. A man wades in the waters, panning for whatever! Kids play among the steaming piles of rubbish, a polluted dystopian reality! A kid tries to fly a kite that is more hole than fabric, making do! This opening clash of images gives you a sense of the contradictions, beauty and challenges of modern Indonesia, and this is the visual method that Jimmy Hendrickx’s uses throughout the film, giving the documentary a heaven and hell surreal feel, effectively used. ‘The world feels heavy on my eyes’. Eka is a gifted wordsmith. The first bravura sequence is when Eka, and his pals in Mohawks, walk across a metal tooth railway bridge, as pretty Indonesian ladies in traditional dress dance! The punks walk by nonchalantly. The shanty town is blurred in the background, as the pretty women dance. This is a wonderfully surreal moment of filmmaking. ‘Begging, looking for money, food, begging, money, food’. This is the level of success he is playing at. He is the other punk the documentary focuses upon, and he has a melancholic sense of pragmatism, but he comes across as an excellent human being! Eka, ever the idealist, thinks that they can still improve themselves, even with their disadvantages. Eka demonstrates the paradoxical qualities of the Indonesian punks, individuals but longing for a sense of acceptance. Eka describes how he ended up on the streets to an Imam, who listens patiently. His parents sent Eka to an Islamic Boarding school, where he felt abandoned by them. Ironically, he felt he could find more comfort on the streets. The Imam considers that the skin can be tattooed, but a heart must be clean. The Imam is more interested in the person, not they’re outward appearance. Edo describes how he met Eka at the railway, his face cut from brawling, and not wanting to go home, as his Dad is an army officer! 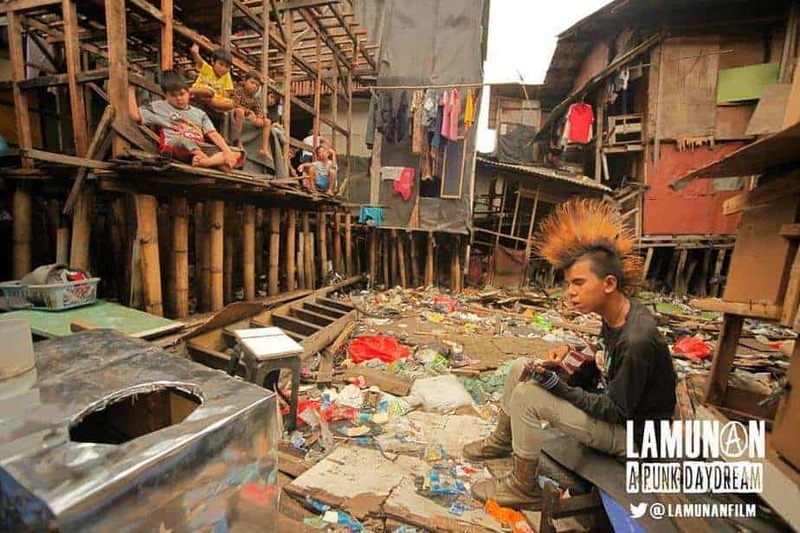 Even though the punks live in difficult circumstances, they have access to a laptop and the internet, as they watch youtube videos about the Indonesian tattoo taboo. They discover folks with tattoos were gunned down by Suharto and his cronies; this helped to create the stigma that tattooed people are criminals. Many people were shot extra judicially, just because they had tattoos! The arbitrary absurdity of tyranny! ‘The children are always wrong’. The director advises Eka that this film could show something else of himself, which initially confuses Eka. The tattooist suggests he can show something to his friends, then Eka realises he can show something about his personality for his parents and perhaps the world. He’s a natural philosopher and actor! The reality of knocking a nail like thing, tied to a bit of wood, which is knocked by another bit of wood, is how they tattoo in Indonesia. The nail pricks the skin and the tattooist is skilled at tapping the needle at speed. It is primitive and painful way to tattoo, but Eka chats away. Back at the abandoned film studio; lights, camera, action! Eka stalks the stage, red laced up boots glaring, pacing. He attempts a bit of improvised poetry, after a few standard ‘be true to yourself’ epithets, he hits upon some simple, but interesting lines. Back at the punk’s computer laboratory, in the slums, they print out some posters of Eka’s ‘I’m a punk in a film’ chic. How, why and where the punks can use this equipment is not divulged, but they have the resources. Eka rolls up the film posters carefully into an art tube carrier. A close up of Eka reveals he is looking nervous. He’s having a meeting with his army officer father, and he has taken him the posters to show him. His father has short hair, the aura of a martinet; he eyeballs the poster and his son, and speaks in stentorian fashion. Authority soaks from this man. His father sarcastically affirms that the Westerner has no tattoos, as the director has been allowed to film Eka with his dad. The director corrects him that he has a small tattoo on his wrist. The officer affirms that something small can be beautiful, but he thinks his son’s tattoos are too extreme. The last statement is obviously a ridiculous sweeping statement as Eka has his tattoos created in civilian life. His father speaks for the authoritarian conservative party line, for it seems any individual who takes a slightly different path in life, from the accepted, regimented norm, is a villain. Clearly absurd, but such people hold the truth of the power they enforce, thus their words have a reality to them, even against his son. Truth is from those that can impose it. It makes no difference if that ‘truth’ is obviously irrational, but we are dealing with human beings! Eka has gone to see his father in good faith, with an olive branch, but alas, his tattoos are the stumbling block. After giving this austere speech, his father then observes the realities of being a tattooed punk, and his attitude does soften. He says that his son won’t be able to find a job or be able to join the army, because of the tattoos. The tattoo taboo in Indonesian society is quite intolerant. His father now gets to the meat of the meeting, for all his austere posture, he is still willing to meet his son, but unfortunately Eka is informed that he still can’t see his mother. Throughout this one way conversation, Eka is silent, staring at his hands and sighs when he realises he still can’t see his mother. This is the source of his real pain within his own heart. No matter how much he has outraged his mother, he still loves her deeply. The film cuts to Eka with shorter hair, but still wild, he is lounging on a sofa with his punk pals. They loiter by the railway, their favourite haunt, the slums at either side of them. Edo, Eka and the unnamed punk, laze with existential ennui. A train goes by as they sit on their sofa, in a shanty town wasteland. It is akin to a lyrics of an old blues song, visually realised; a beautiful moment of absurdist cinematography. Eka reflects on his relationship with his mother, as if he is talking directly to her in a soliloquy, but she is just a ghostly memory. The camera focuses on a mature lady, fishing through rubbish and detritus by a stream, an apt metaphor. ‘I enjoyed it the most when you asked me to help you in the house. I didn’t want to leave you even just for a while’. Even among the steaming piles of rubbish, in this polluted infected interzone, beautiful flowers still manage to bloom. In a fine garden, a young mother nurses her baby, the tenacity of nature, beauty and love, against all the odds, in the slums. This juxtaposes Eka with his more privileged background, his fall from grace and the absence of love from his mother, which sheers him with pain. On a local news broadcast, a voice intones that three tattooed men have been arrested for drug possession. The Dayak perform a ritual dance in one of their traditional longhouses, an old gentleman performs with grace, tattoos on show. He is joined by a young lady in traditional garb; she duets with the old man, a dance that cuts across generations. Mothers with their children watch the dance. The Dayak perform their act of tattooing in exactly the same fashion as the punks. The tribal way is the true way. A lady explains the nature of the tattoos. The camera touches upon idyllic shots of unscathed Indonesia with children playing in a healthy clean environment. They are far away from the massive piles of steaming rubbish. A young punk band plays, bare chested, underfed, tattoo adorned, they go for it, performing with raging ferocity, screaming out their frustrations. Eka is now with dyed ginger hair and a fetching red leather type coat. He dashes through a forest of concrete posts, as his journey is intercut with the fiery punks, a superb slice of editing. The punks scream out their music; guitars, bass, drums, classic raging punk rock’n’roll, 1000mph! Eka grabs a bucket of water and chucks it on his friend Edo who is fast asleep on the threshold to his parent’s shanty house. He snoozes on small square of tiled floor. She says that his father was accused too, that he was a robber, even though he has no tattoos! His mother is pleased he is featured in the film, as people will see that he is not arrogant or pretentious. That is for sure, she knows her son well, as Edo is a good natured lad, with a sense of the absurd and a healthy dose of cynicism, so he can survive. Edo explains that he doesn’t live with his biological parents, but adopted parents, who care for him very much. He absurdly explains that his biological parents blame him for his situation, because he’s a punk. He rightly points out they neglected and abandoned him, so they shouldn’t complain. As Edo and Eka take stroll through the slums, a punk band plays on the soundtrack; the translated lyrics appear in the subtitles. These lyrics have the sense of humorous existential alienation. Stinking, singing and drinking, the Indonesian punk version of wine, women and song! Whether these lyrics are literal or metaphoric, who knows, but they might as well bust the alcohol taboo, as they are already feared from the tattoo taboo, true outsider punks! Eka now cuts Edo’s hair and he is very specific with what he wants, giving detailed instruction, to make sure his hair is suitable wild. Polenk, a fellow punk, sits by, with excellent punk hair, so Edo advises him to be inspired by Polenk’s hair. With any subculture, mods, rockers, teds, goth, various shades of metal etc. attention to detail is essential, even if the overall look seems somewhat shambolic. A lot of effort goes into looking like a shambles or a peacock, depending on the style tribe, true subculture pride! There is now a disturbing aside, into the nature animal slaughter in the slums. There is no hiding behind abattoir doors here, all in the open. All I can say is that it left an indelible mark on my brain. People in Indonesia have to do what they have to do to survive, but be warned, this moment of animal slaughter is disturbing and surreal, in its robotic ritual. Edo looks somewhat perplexed, even shocked, by the scene he is witnessing, but he has to eat! The camera follows two of the previous generation’s punks walking from some shrub style greenery into the urban wasteland. They are all dressed in black, smarter, black short hair, some with tattoos, and some less so. They ponder the reality of Suharto’s 32 years of rule and how everybody was fooled. The onset of the monetary crisis in 1998 led to a fightback against this violent regime, with the 1998 punks joining the fightback. This is where subculture turns into something far stranger and extremely dangerous. All the punk rhetoric of London 1977 seems to have been put into action, with tragic consequences for the 1998 Indonesian punk generation, but they stood firm. The idea of John Lydon, or even the great Joe Strummer, leading a protest against a very violent state, would be preposterous, but not so with Indonesian punk! Though the confrontations had a heavy cost for the punks, Suharto resigned, with the genuine possibility of reform. Unfortunately, much of the old guard is still entrenched in the reformation era, though there have been some fudged democratic crawling moves. The older punks show the director their scars from the confrontations, with one showing his healed bullet wound from being shot in the leg. The punks are scarred literally and mentally, but they will still challenge anything or anybody that is in the way of the nation, trying to transform Indonesia into something more positive. The punks have a monumental challenge, and these older punks still believe, no matter the cost, that Indonesia must move forward in the direction of equality and personal liberty. In a punk hangout, one lad irons his t-shirt; Eka plays pool, a drum kit and a motor scooter in the background. A friend of Eka considers the options, now that he is inked. Finding a regular job is going to be difficult, so he might make a living through a small business, or self-employment, as a possible way forward. This is one option that many of the savvy punks have decided upon. The director cuts to a couple of punk trying to sell LED lamps and bulbs by the roadside, for a competitive price! Noise Punk! Folk Punk! Tattoo Punk! Heartbreak! As with any regional variants of a subculture, Indonesia has its own indigenous folk tradition of music, which the punks have transformed into a folk punk style. There is still the classic punk of drums, bass, guitar, with lots of energy, shouting and screaming, but there is also the Indonesian ukulele punk too. This little instrument enables the punk to sing more melodic songs, but with more idealistic political lyrics. The ukulele punk is very important to the young punks. It is as much of a stress relief as the blistering barrage of frantic noise punk and their desperate lyrics. The director now focuses on a big gang of tattooed punks, some bare-chested, other in vests and t shirts. They are all led by a young woman in a leather jacket, wild black and ginger style hairstyle, in a long bob. She leads the punks walking up the railway track, as a traditional song plays in the background, a surreal juxtaposition between their tough image and the melodic quirky nature of traditional Indonesian music. Eka is back at the Mosque, once again, asking practical advice from a local Imam about his conflict with his parents. Again, the religious figure offers sensible advice. He considers that Eka’s parents are the ones that need to change and set an example, so that Eka may change, and then everyone will be on the righteous path to God. Eka buys a cake and sets off to the family residence. His attempt is in vain. His family home is positively abundant and grand, surrounded by a large fence, to keep the rabble out. Eka is from a well to do, probably, upper middle class family. His current situation, in terms of his privileged upbringing, is certainly different to many of his friends. He may have fallen further, in relation to the Indonesian class structure, but he has his punk comrades, willing to take him for what he is. Life is tough and alienation creeps, but he has friends who are willing to help him out. In front of Eka is a big gate that won’t open. No one comes to the gate, he is just stands there peering over the top, with his cake and his poster tube. It is a melancholy moment for Eka. He has covered his tattoos and seems to have let his hair grow into a semi-normal hairstyle. He calls to his mother, but to no reward. Disappointment etched upon his face. Eka is back at the punk club, with a thousand yard stare, looking completely rock bottom. He finally joins his fellow punks in the fray, as a punk band kicks off its set. A lank haired young woman screams her lament, as the band charges along at 1000 mph. Another young woman joins the singer, and they both scream their rage. All the punks seem to be in various states of existential angst. Eka loses himself in the maelstrom of punk melancholic mayhem. The director focuses on poverty stricken people trying to scrape out a living from the polluted and litter infested river, a sad slice of irony in itself. Eka speaks another soliloquy to his mother. He hopes that she still thinks of him. He desperately misses her and he loves her. An older punk, with a fine Mohawk, piercings and facial tattoos, philosophises about the nature of tattoos, to the punks. Tattoos originated from older, tribal, more spiritual roots, but for the punks it is an expression of personal freedom; in a land of limited freedom, vulture capitalism, post-autocratic corrupt state, and mass pollution, this is a bold statement. He dismisses the popular prejudice that tattoos lead to criminality or they are only for criminals, as idiotic. Some young punks now demonstrate the nature of ukulele punk, jaunty bright rhythms, singalong melodies, vibrant but critical lyrics. Some dense lyrics from the bright nature of the melody! There is now a strange scene which moves from a fly on the wall documentary into the realm of theatrical cinema. Is this a slice of Orson Welles style subterfuge afoot? Again, there is no explanation or context, just a sense of perplexed surrealism. We’re back in the film studio or perhaps a stage, a man in an army uniform stands centre stage, lights glaring, smoke drifting. His father, with all his furious authority, faces Eka. The young lad asks for his family to pray for him on the streets, so he can stay safe. He wants to show them the real Eka, but he will keep trying and show them the evidence of his self-improvement. This is a bizarre setting for meeting, especially with his father in full uniform, all glossed with a cinematic sheen. Is this a punk example of smoke and mirrors, to encourage Eka to find his voice with his family? Curious and weird stuff! Lounging around, Eka smokes, Edo strums the ukulele and they sing songs, with dreams of equality. This is a somewhat melancholic moment. Now Edo recalls a strange tale, in which he says Eka met his wife a year ago. They met on Facebook, but having never met each other, they still got married! There is now another strange scene with Eka, the bride and her family all in their finest dress. Eka and his wife are in religious costume, their tattoos poking through on their hands. The young woman is pregnant. It is obviously not Eka’s as he’s not met her before! Edo considers the issues that an unmarried pregnant mother might face in Indonesia, about her reputation, gossiping neighbours etc. Edo and Eka are now hanging out at the railway, and Edo asks him about this strange turn of events, why did he get married to someone he didn’t know off Facebook?! Even in the slums of Indonesia, Facebook prevails! Eka simply says that he loved her so they got married. Edo is perplexed by that answer, but Eka explains that he wanted to help her. Edo is still astounded, as he took on a problem that was not his, but Eka wanted to help the woman out. He didn’t like the idea that the child wouldn’t have a father. Throughout this episode, Eka found a job and worked really hard, but unfortunately for him, the girl spent all his money going shopping! The whole situation seems bizarre and even comedic, but Eka tried to be responsible on a whim. Perhaps he was trying to show his maturity, but marrying a woman he didn’t know, at short notice, would have serious challenges. Eka worked even harder to keep on top of the finances, but he got to the point he was so upset, he left! Eka weaves through an ash strewn wasteland, leafless tress, and polluted river, his red boots shining against the ash bleached landscape. A fine slice of cinematography, as Eka dreams of a family life with children. From the dress, hairstyles and clothes of the punks, the timeline of the documentary does jump around, but you have to notice the changes yourself, in terms of changes in Eka’s and Edo’s punk style. We’re back to the cake and Eka’s failed mission to see his mother. He may as well feed his punk brothers with such a delicious offering; the punks eat the cake with glee. Edo now gossips with the punks about his annoying biological mother, who is nothing but an irritation to Edo. To say he is exasperated with biological parents is an understatement. She wants him to sell vegetables and give her the money, when both his adopted parents are sick. We know instinctively where any of Edo’s money will go, if he has any! There are limited, if any, public services in Indonesia, so medicine costs money. Edo is frankly furious! One of the other punk talks about his dysfunctional family, he still lives with his biological mother, but he has a step-father. He says he father divorced when he was a kid and now has many wives! He allegedly has twelve wives, which the punks find amusing. Eka asks if he wants revenge on his father. The punk says he used to want to get back at him, but his anger has drained away. Edo sits with his ill adopted mother in a clinic, she looks really ill. Some of his punk friends come and sit with him, giving comfort to their friend and company for his seriously ill adopted mother. It is internet café time in the slums, and Edo watches a YouTube video about the Indonesian army humiliating punks, both male and female, in some sort of boot camp. They are slapped, their hair is cut, the ultimate humiliation for the punks. They are genuinely distraught at this enforced punishment. Autocratic institutions and their policies of humiliation, is detestable whether it is in the East, West, North and South, especially against minor infringements. Those that don’t follow the accepted norms, and follow their own paths, will be punished. As the YouTube humiliation video plays, a punk band blasts out its fully righteous anger! Now there is another fantastic slice of filmmaking, as a punk walks through the slums, bare-chested, his back tattoo on show, in long shorts. He strides through the cramped shanties, women putting on makeup, clothes drying everywhere, people squatting down here and there, old young, children. The punk walks into a blinding light, out of the shanty town, to a rivers edge, polluted to high heaven and he dives in! This is all done in three shots, excellent! A punk ambassador considers matters over a montage, of the punks and their tattoos. A punk looks upon a waterfall in idyllic Indonesia, greenery, not steaming ash piles or polluted water, just life in nature. A Dayak lady dances at the edge of a clean river, her child watching, paddling in the water. There are wonderful images of the Dayak at ease, at play, at work. A tattooed elder of the tribe reflects on ‘civilisation’! A man explains their sustainable way of living, taking enough, but never too much from nature, adorning themselves with flowers. The director demonstrates the tattoos of the tribesman, both old and young. A young man tribal member explains, ironically, that he is a student of economy and management back in civilisation. He has tattoos and speaks bare-chested like the elders. This is a devastatingly sad statement, but ‘development’ eats everything in its path, to be ‘consumed’ by the ‘hidden hand’. Progress is death. Being both a tribesman and a student of capitalism, he knows what the sad outcome will be. Will it be a life of balance, or working for the 1%?! In a beautiful Dayak longhouse, tribesmen, semi-naked, in their traditional flowers, beads and tattoos, ready themselves. They pray that the anger of the outside world stays away, as they prepare to ritually slaughter a chicken, in a swift, quick, method. All hunting must be sustainable, take what is needed to survive, without unnecessary cruelty. Let nature flourish, so that all can live. Flowers adorn the longhouse. A tribesman and a child stare out to the edge of their lands, behind them forest, a land flourishing, in front of them a vision of hell, or should that be progress. There is a massive quarry, with explosions going off galore, massive trucks roaring on the dusty roads, a scene of desolation. This is a fine rhetorical slice of filmmaking, with no need for words, just the image of the tribesman staring out into the desolation of heavy industry. Jimmy Hendrickx uses the camera ‘to show not tell’. Edo and Eka are on the street, Eka with the ukulele, Edo seems upset, wiping tears from his eyes, no reason is given. Indonesia is a land of contrasts and extremes; there is the desolation, pollution and heavy industry, but also the raw power of the earth. Indonesia is also known for its plentiful erupting volcanoes, a metaphor for the nation itself. Indonesia has a rapidly expanding economy with extensive growth, but massive inequalities. What path will this post-autocratic nation take? A volcano smokes away, a desolation of ash, that one day will transform into fertility. Lava flows, bubbling, a crust skimming over the raw molten earth! The director shoots some fine sequences of the volcanic power, of desolation and of lava. The volcanic power is contrasted with a machinist factory, the raw low wage economic power of Indonesia. The workers are cutting out metal parts, kitchen utensils, parts for machines etc. A punk band plays on the soundtrack, as the workers go about their business in the factory. A bare chested punk, with his back tattoos on display, watches the proceedings in the factory. This is another surreal, absurdist moment within the documentary. Back at the abandoned film studio, Edo explains the workings of the studio, under Suharto to Eka, who is still baffled by its purpose. Edo is knowledgeable and cynical about the reasons. He sits in a mass of waste film reels; he regales Eka with a tale about the dictatorship. The regime made the remote tribes eat rice, even though their diet resolves around their local palm trees. Anything goes for the regimes own profit, including enforced commercial interests pushed upon the tribes. Edo is certainly switched on the use of power and the media; how the ruling class deflect issues from their own failings by scaremongering and smearing those that see useful as enemies, through propaganda. This discussion about the use of power is now juxtaposed, by such a use of power by the state. A big carnival style procession moves through the street, filled with children, soldiers and policeman, described as ‘anti-drugs, anti-radicalism, anti-criminality’! Young people in traditional clothes mix with children from youth organisations in uniform, they all dance. They are surrounded by more men in uniform; the whole thing is surreal, absurd and sinister. The use of children, for propaganda purposes, by the state, send shivers down the spine. The abstractions of anti-this and anti-that, with a whole load of generalisations leads to nothing. A general anti-drug drive could make sense, without a load of soldiers hanging about, and a puritanical vibe. This carnival seems a big turnoff for the slums, as the crowd are not particularly brimming. The crowd is the carnival! To make things worse, and completely humiliating, the state shows its power by using children in punk clothes, paraded through the streets, amongst the procession of other children, with signs around their necks written ‘drug user’. This is pitiful stuff, and very disturbing, the post-autocratic autocracy showing its teeth. A wise punk monologues in the background, against this sinister scene. The wise older punk, with his impressive Mohawk, is like the punk George Orwell, as the state uses children to enforce its message. The use of children by authoritarian states, is still gut wrenchingly nauseating and creepy, as it ever was. The older punk also hints at the darker areas of Indonesian modern history, which have been whitewashed. That is for another tale, which other documentarians are starting to shine a light on those shockingly evil events such as Joshua Oppenheimer’s “The Act Of Killing” from 2013. The carnival of state propaganda weaves its way through the streets, the punks dash to a carousel, have fun, drink booze, smoke. They are being young, boisterous and full of life. Eka and Edo sing ukulele punk songs on a bus; the passengers seem unconcerned at the singing. This is a sweet slice of footage by the Jimmy Hendrickx . Another abrupt juxtaposition in the film and we find Eka has a close cropped hair. It looks like he ran afoul of the law. He recalls having his picture taken by the chief, his earrings removed. They took his necklaces and he hand over his ukuleles. There is a mega close up of Eka’s red laced up boots, the director goes for a spectacular metaphorical shot, three punks sprawled out in misty volcanic landscape of desolation. They are all crashed out on the ash, Eka, Edo and the unnamed punk. This a magnificent shot, dashed though with a dose of surrealism. The punks feel at home and relaxed in this eerie science fiction style landscape; the beauty of the Indonesian volcanic landscape and the beautiful punk souls. The director creates a short montage of the Dayak; an elder man singing a lullaby in the longhouse, a father and daughter kayaking through the forest, various tribesmen, of varying ages, bare-chested with their tattoos on show, pose for the camera. All seems calm at a languid pace, no rush, but there’s a melancholy quality to these images. The director offsets this moment of pathos when he is filming a young hunter about to spear a fish. The hunter is told that his underwear is poking through his tradition tribal dress, which is a genuinely amusing moment. The old ways with modern underwear, Jimmy Hendrickx injects a witty moment satirising his own weighty anthropological filming. The hunter tries again, fully in tribal style, and catches a fish. Eka is lounging and voice congratulates him on his acting performance at the theatre. The director now opening hints at some Orson Welles trickster style flourishes to the documentary. Eka states that the actor was so similar to his father, the quality of his voice and his look, that he found it easy to release all his thoughts and feeling about his parents, even though he’d not met the actor before. It seems the previous strange scene with his father, was an improvisation with an actor, so Eka could emote. The earlier scene in the office with his father, seemed more realistic mainly due to Eka’s silence and his withdrawal into himself. This is a genuine puzzling aspect of A Punk Daydream, that the filmmaker has left the family drama to unravelled by the viewer, or they could be tricking us in other ways, in the Orson Welles style. What scene between Eka and his father is real? Is it all theatre? Is it s mix of the real with dream? Whatever the reality, the family drama is certainly intense. Eka reasons that there must be love in his father’s heart, as he did once look after him, but his father tells him to leave. Eka informs him, he won’t see him again. That is that. A sad fractured family situation, simply because Eka is a punk. Molten lava pours, and music switches back to rowdy noisy old-school punk. There is a gig and punks are in ready to rage. The director intercuts images of Eka at the gigs looking, splashing molten lava and the music switches back to tradition Indonesian music. Eka freaking out with the punks is juxtaposed with him being weary and somewhat wasted. There is a horde of punks at the gig. The gig switches to the forest, a Dayak tribesman is in full ritual regalia, with mask, feathers and outfit made of foliage and leaves, one of the famous ritual dresses that Dayak are famous for. Three Dayak dance through the forest, in their ritual clothes and masks, a wonderful slice of footage. Edo, Eka and the unnamed punk are all in full Mohawks, maximum punk, and they wonder through the volcanic desolation. Eka makes his final soliloquy to his family as they wonder through the desolation. He declares is that he‘ll stay away from their lives. They’ll be happiest if he’s not around and he wishes them well. He finally flies away from the nest. The city! All roads lead to the shiny metropolis, even for the punks. There is a bus full of punks on the way to the city, all in their finest gear, plenty of Mohawks and spiked hair. A young woman sits with a snake around her shoulders, just to add to her punk rock’n’roll value. There is a full cornucopia of tattoos on display accentuated by their moody smoky looks. The metropolis towers outside, as the girl punk pets her snake. A punk sits on top of the bus, taking in the city air, wind blowing in his face, a humorous daredevil touch to the scene. Eka is on the bus, with his piercings, spiky Mohawk, fidgeting with a cigarette. The three punks in a volcanic landscape intercut the bus journey, as they frolic and run along the ash canyons, full of life. Edo plays his ukulele, Eka and his friend run for the fun of it. This is the complicated beauty of Indonesia and its energetic youth, if only they were given the opportunity to shine. Jimmy Hendrickx completes his surreal and paradoxical documentary film, bombarded beautiful and appalling images. It is a true punk daydream brimming with life, colour and wonderful people, in difficult circumstances.